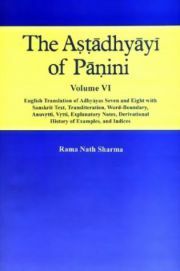 his volume of the Astadhyayi of Panini contains English translation of adhyayas four and five. It includes Sanskrit text of individual sutras with their transliteration, word-boundaries, indication of inflectional endings and formation of compounds. Each sutra is also furnished with anuvrtti, vrtti, examples, detailed explanatory notes, and complete derivational history of examples cited by the Kasikavrtti. Explanatory notes are presented to facilitate proper understanding of individual sutras, especially in view of their formulation, interpretation, application and relative placement. An attempt has been made to sort out and explain pertinent issues, as raised and discussed by major commentaries. The appendix contains nearly three hundred examples with complete derivational history. Over five hundred derivations have been discussed in notes under individual sutras, especially from the point of view of their relevance to the Paninian grammatical system. This volume is the fourth of a now planned six-volume study. The fifth volume of this series will cover the sutras of adhyaya six. The sixth and the last volume will include the remaining adhyayas, seven and eight.